The copper wire leaf sculptures shown in Lia Griffith's tutorial are simply stunning. Especially when displayed in a group. The concrete and gilded base is heavy enough so the sculptures don't tip over. As the designer said, use these as home decor or to display your jewelry either at home or at a craft show. You can make them as small or as big as you like. It will take a while to put together larger sculptures. I just love the idea for the Shapecrete (concrete which works like clay) base. 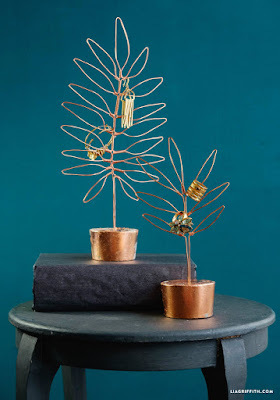 So you could make concrete bases for wire wrapped trees too - see tutorials in the first link below.